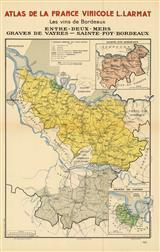 Description: Burgundy wine map focusing on the Beaujolais regions. Printed colour. Description: Attractive wine map of the vineyards surrounding Bordeaux, specifically the Graves, Graves Superieures, and Cerons classifications. Original printed colour. Description: Attractive map in printed colour showing the wine regions and vineyards of Cotes de Blaye and Cotes de Bourg. 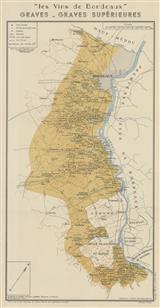 Description: Map in printed colour showing the vineyards of Entre-Deux-Mers, Grave de Vayres- Sainte-Foy-Bordeaux. Description: Champagne wine region. Statistical chart relating to the harvests, consumption and quality of Champagne wines from 1844 - 1943. Printed colour. Description: Cognac Region. Detailed wine map of the region. Original printed colour. 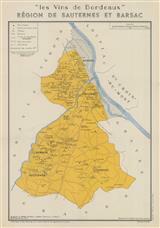 Description: Bordeaux wine map showing the Sauternes and Barsac regions. Printed colour. 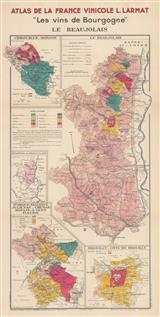 Description: Vintage wine map of Lalande de Pomerol and neighbouring region, Néac, near Bordeaux. Showing the wine region's vineyards and châteaux. Printed colour. 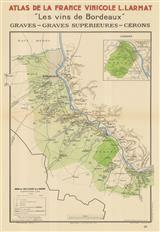 Description: Vintage wine map of Bordeaux along the Garonne River to Barsac. Showing the wine region's vineyards and châteaux. Printed colour. 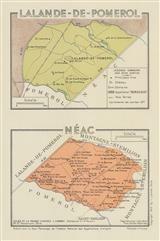 Description: Wine map of the Mâconnais region in southern Burgundy. This area is known for white wines, specifically Chardonnay. Printed colour. 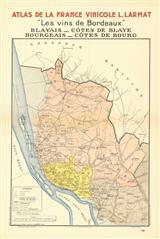 Description: Vintage wine map of the Haut Médoc region along the Garonne River from Saint-Estèphe and Pauillac to Margaux. Showing the wine region's vineyards and châteaux. Printed colour. Description: Bordeaux wine map focusing on the Cotes de Bordeaux region and highlighting various Chateaux. Printed colour.